Research shows that the most effective way for children to learn is through play. Play underpins the Early Years Foundation Stage (EYFS). 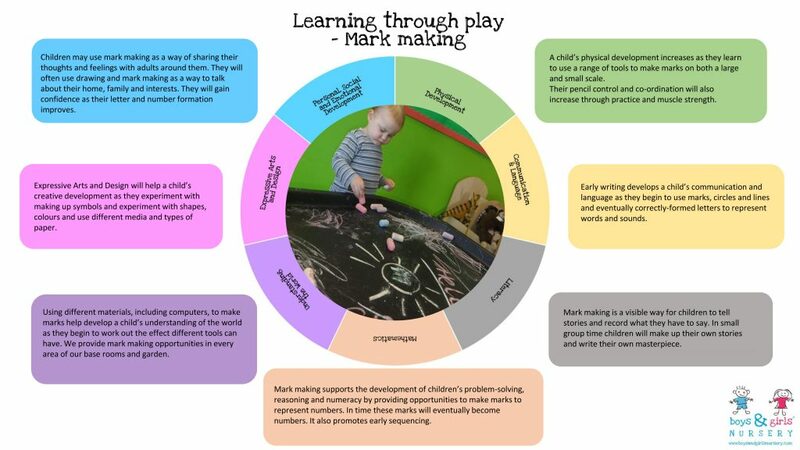 Each area of learning and development must be implemented through planned, purposeful play and through a mix of adult-led and child-initiated activity. At Boys & Girls Nursery we understand that for children to learn through play they need to feel safe, secure and confident. We provide a fun and stimulating environment which offers a wide range of opportunities to inspire young children in our care. Our continuous development allows children to grow in all areas of the EYFS ensuring they are school ready. Children may use mark making as a way of sharing their thoughts and feelings with adults around them. They will often use drawing and mark making as a way to talk about their home, family and interests. They will gain confidence as their letter and number formation improves. A child’s physical development increases as they learn to use a range of tools to make marks on both a large and small scale. Their pencil control and co-ordination will also increase through practice and muscle strength. Early writing develops a child’s communication and language as they begin to use marks, circles and lines and eventually correctly-formed letters to represent words and sounds. Mark making is a visible way for children to tell stories and record what they have to say. In small group time children will make up their own stories and write their own masterpiece. Mark making supports the development of children’s problem-solving, reasoning and numeracy by providing opportunities to make marks to represent numbers. In time these marks will eventually become numbers. It also promotes early sequencing. Using different materials, including computers, to make marks help develop a child’s understanding of the world as they begin to work out the effect different tools can have. We provide mark making opportunities in every area of our base rooms and garden. Expressive Arts and Design will help a child’s creative development as they experiment with making up symbols and experiment with shapes, colours and use different media and types of paper.